Bar-Bar-A has been successfully watering cattle the easy way for over 25 years. Cattle learn quickly and have ready access to fresh water. Whether watering small or large animals Bar-Bar- A will work for you. Hot standing water in traditional automatic cattle waterers, tanks, or buckets limits water consumption. Decreased water consumption results in less production and health for your cattle. The Bar-Bar-A produces fresh summertime water at a cool temperature. All this because the source water comes from underground water lines and when the cow finishes drinking the water drains back into the ground, leaving an empty bowl.This means more water consumption and and healthier cattle. In winter, cattle also are challenged with proper hydration because of the icy, frigid standing water exposed to winter air. Because the source water for our units comes from a buried water line, the water is much warmer and easy to drink. In the winter, electrically heated water can be heated so warm that the water is not at comfortable temperature for consumption. The Bar-Bar- A is not limited by these factors. Decreased water consumption results in beef cattle that do not add pounds as fast as hydrated cattle. Dehydration or inadequate water consumption in dairy cows or cows with calves reduces milk production. Water is paramount to both situations. Overall health is also affected by proper water intake . Whether you are located in California or Minnesota the Bar-Bar-A automatic watering tank, with its non-electric benefit, will fill your needs. At a pleasing water temperature year round your cattle will drink more water and you will not need to worry and work with the algae build up that accompanies water tanks and other automatic cow troughs. Cattle that are healthy as a result of good nutrition and proper water consumption tend to avoid disease and sickness. Proper minerals and proper water consumption are required for a healthy immune system. 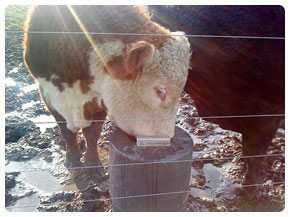 The ability for cattle to absorb minerals and nutrients is greatly enhanced with proper hydration. Sickness and disease are not encouraged with good water nutrition. In the winter stress is especially hard on the system in the cold temperatures. Without adequate water levels in the body, cattle are at a disadvantage in just about every way. 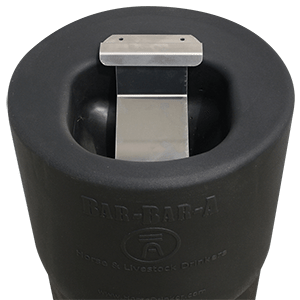 With the Bar-Bar-A cattle waterer our top priority is to help you keep your cattle’s water consumption at proper levels.